The University of Tennessee Graduate School of Medicine provides patient care services in family medicine, genetic counseling, occupational medicine, obstetrics and gynecology, and internal medicine. 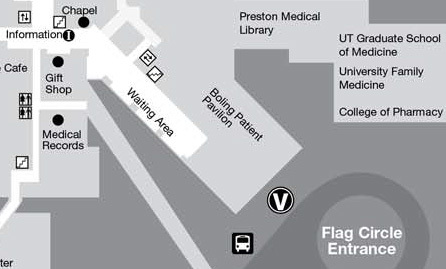 These patient care locations are staffed and operated by UTGSM faculty, residents, and staff. For a listing of patient care providers and locations affiliated with the University of Tennessee Medical Center (UTMC) campus, please visit the UTMC website. The University Family Physicians (UFP) is a patient-centered medical facility providing full-spectrum primary care services. UFP serves as the main state-of-the-art training site for our family medicine residents as each works under the area's finest family medicine faculty. For an appointment, please call: 865-305-9350. University Occupational Health Services provides a full range of services to safely place workers, maintain health and productivity, and restore injured employees back to the workplace. University Occupational Health Services offers pre-placement physical exams, return-to-work exams, work-related injury treatment, drug screens, breath alcohol testing, medical surveillance, FAA pilot medical exams, immunizations needed for travel, and other medical services specific to industry. For an appointment, please call: 865-305-8831. Our office is staffed with eight Board Certified Internists and thirty resident physicians dedicated to serving the primary care needs of the East Tennessee community. Each patient will be seen by a resident physician under the supervision and guidance of an attending physician. To schedule an appointment, please call: 865-305-9410. The office is open Monday - Friday from 8:00 a.m. to 4:30 p.m.